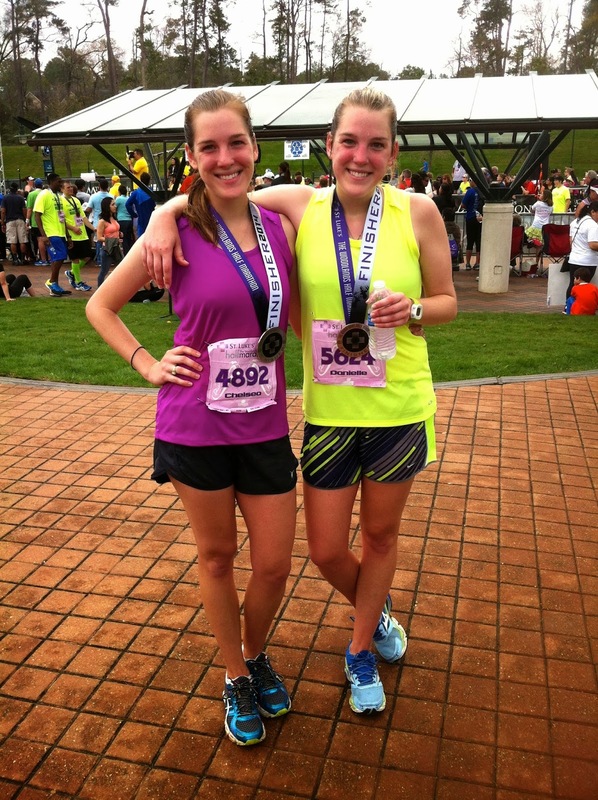 Four months of grueling training paid off when my twin sister and I crossed the finish line in our first half marathon on Saturday! It was the culmination of a lot of hard work, blisters, and sore muscles, and I honestly can't believe it's over. It was terrible and a total blast all at the same time. Crossing that finish line was something I never expected to do, and I wouldn't have done it if it weren't for Danielle. 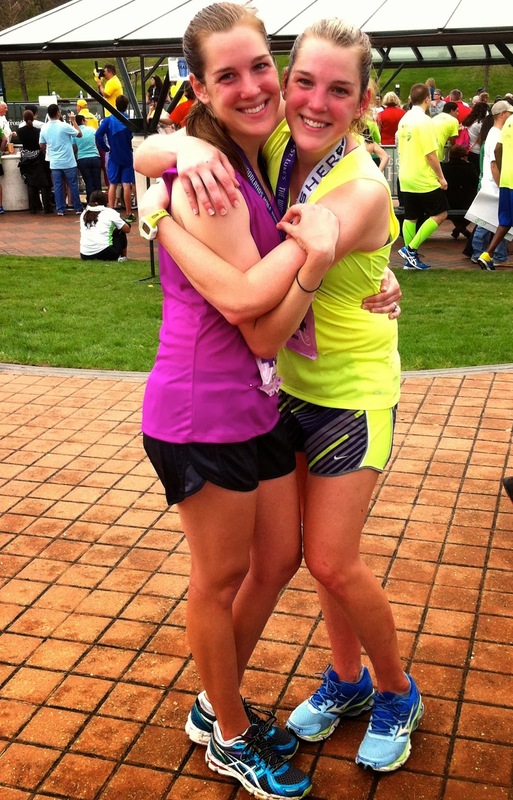 She was the one that came up with this crazy idea to run a half marathon, and I don't think I could have ever found the motivation to do it by myself. She was my rock through the training process, and this is an experience we will treasure forever. We woke up bright and early at 5:00 AM on race day energized and ready to go. Adrenaline was already kicking in (thank goodness since we were up at that gosh awful hour on a Saturday), and we were fired up and ready to get to the race. We got to our corral and were off by 7:10 AM. It felt so good to finally be running! Seeing our family cheering us on at the starting line and running with so many athletes was such a rush. I now understand why people get addicted to running these races. It's much cooler than I thought it was going to be. Parker even jumped in the race at the beginning to take a quick video, which was hysterical to us and the runners around us. Everyone is still in the laughing, happy stage on the first mile. Everything went fine the first couple of miles, but it didn't go as we had hoped from there on out. The weather was hot and humid with a slight breeze coming and going. To me, this was great. This was the weather I was used to training in, and I even told Danielle before the race that this was identical to the weather in which I ran the 10 mile training run. For her, though, this couldn't have been farther from what she was used to. She lives farther north and is used to much cooler temps. By mile 3, she was dehydrated and dizzy. We stopped for water so she could try to cool off, but the damage was done. We had to stop several more times and decrease our pace, but she dug deep and was able to finish the race. I really can't imagine finishing a half marathon while being sick from dehydration, and I give her huge credit for getting through it. 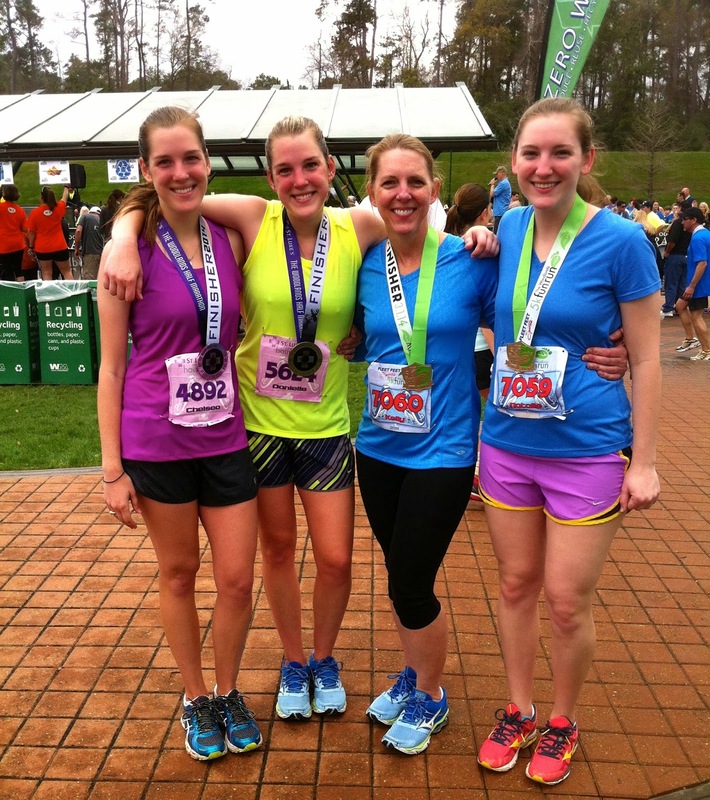 Crossing that finish line with our family cheering was so sweet! Our finishing time was 2:44:31. This was a disappointment to both of us and about 30 minutes longer than we originally planned, but you play the hand you're dealt, and you do the best you can. She got sick, and that could have been either one of us. Bottom line: I wasn't finishing without her, and she wouldn't have finished without me. I couldn't have gone on this journey without Danielle, but I also couldn't have done it without Parker. He has been so supportive and encouraging throughout this entire process. He was understanding when I missed countless lunch dates for training, and he was encouraging when I had a bad run. He was also tolerant and never complained about how much I talked about running. I feel like I have been a broken record about all the training, which is enough to drive anyone not also training up the wall. He never wavered in his enthusiasm for what I was doing, and he was always a listening ear when I needed it. I got pretty lucky in the husband department, that's for sure. Not only did Danielle and I run the half marathon, but Danielle's husband, Logan, ran the full marathon, and my mom and sister ran the 5K. It was definitely a family affair, and Parker, my dad, and my youngest sister were out there cheering us on the whole time. I am so proud of my mom and sister for running the 5K, and my brother in law is a beast for completing the marathon in under 4 hours. I have nothing but positive things to say about this experience. 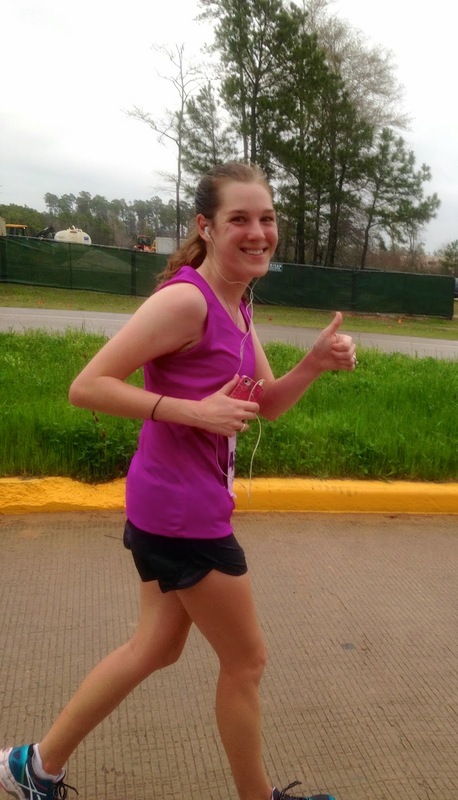 I had never run more than about 3.5 miles less than 6 months ago, and I just ran a half marathon. 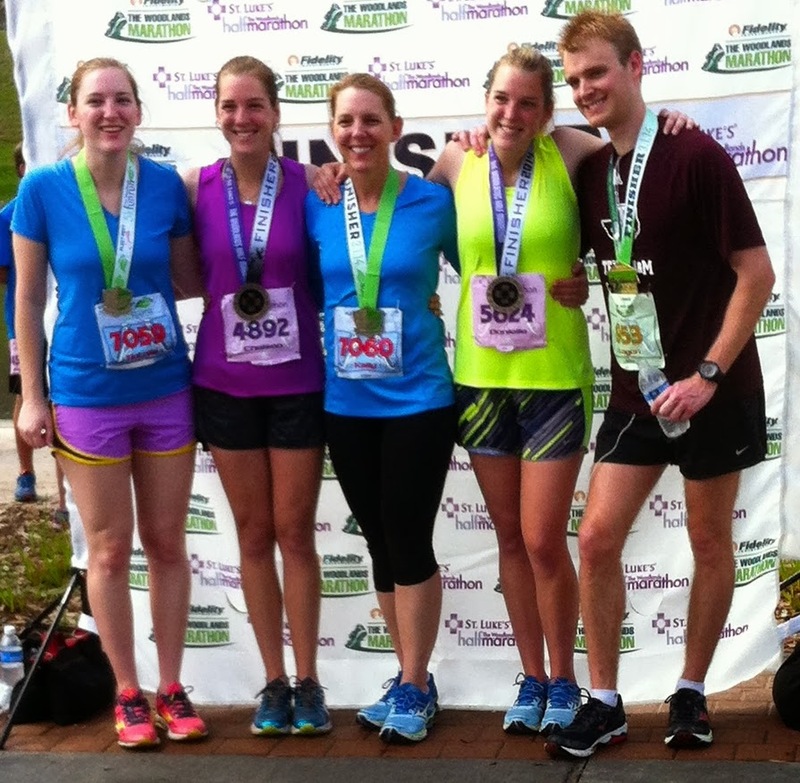 Not only did I run the half marathon, but I genuinely enjoyed the half marathon. More than anything, I am glad Danielle and I got to go on this journey together. I couldn't be more proud of her. 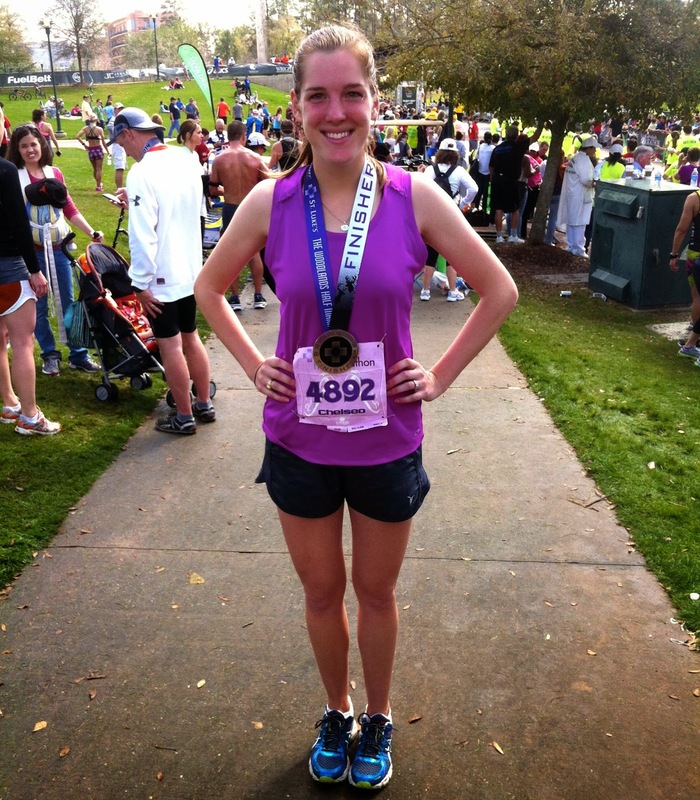 13.1 and done! Congrats!!! And how cool you have a twin!!!! Y'all are both rockstars!!! This makes me so nervous and excited for mine in a few weeks! Wow! HOW COOL! 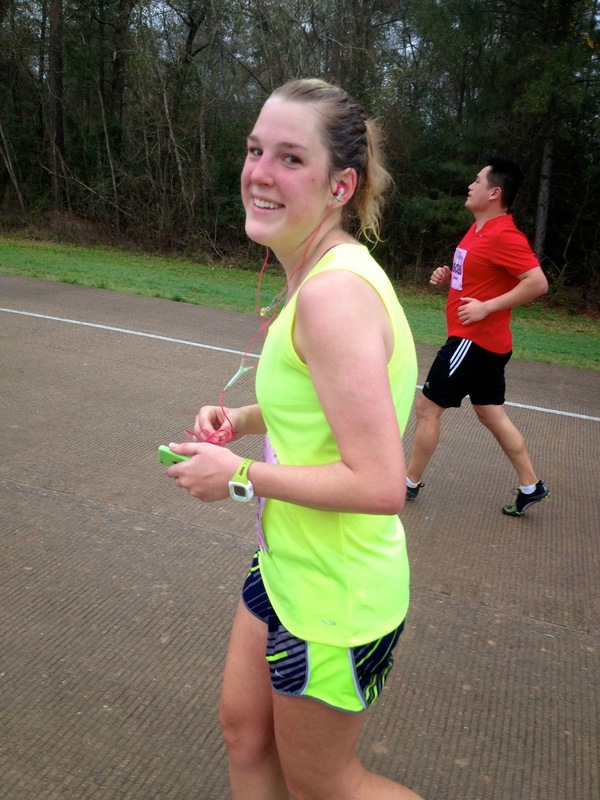 Congrats on your first half marathon!! Yall should sign up for the Houston Half.. Though I'm pretty sure that passed in January. I remember Marshall stayed with us for the weekend (since my parents are in Houston) when he ran that. He didn't even train at all and beat his PR. Crazy huh? I guess that's what the A&M Corps Marathon Team will do to ya! I am itching to start training for some 5k's here pretty soon! Awesome job! They are addicting! Once you've done one, you will want another one. :) Especially since you didn't get your goal time--I still haven't accomplished mine and I've ran 4. Congratulations! Y'all are just awesome! You make me want to sign up for a run now. Wow congrats! I dont think that I could do that! Congrats, chica! Looks like an amazing family affair. I love how you and your twin… and your whole family in general are so supportive of each other! Hooray for you & your family!!! What an amazing accomplishment to have under your belt :) I'm so sorry to read of your sister's illness - what a nightmare that must've been for her. I'm sure she was so thankful to have you by her side. Congrats! Way to go! That is awesome you did your first half! That is a huge accomplishment and how cool you got to share it with your sister! That's still a fairly good time for your first time out, especially with issues! You should be proud regardless because you did it! So great you could finish together! Congrats! You worked so hard for this! Even better that it was a family affair. Congrats girls! That is awesome and I love that you two stuck together so you finished together! Congratulations! 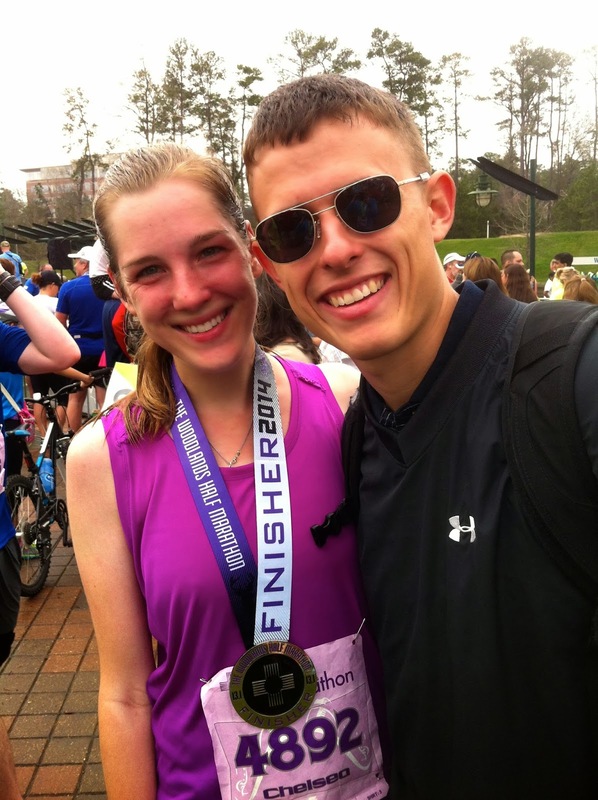 I think it's awesome that you finished together, and 2:44 is nothing to scoff at. There are millions of people out there that couldn't run a half at all! So, when's the next one? Congratulations!! What an amazing accomplishment. Training for a half is my plan to get back into shape post baby. I'm still running now, but I feel sooo slow and clumsy. I can't wait to get back into "real" running. Congratulations!! What an amazing accomplishment! Congratulations!!!! You are a total rockstar. I'm not brave enough to try a half marathon. After scouting at several local stores. I was surprised I could get the same stuff online for much better prices. Now, I am much more cautious in what I take. seriously - congratulations to both of you!! i was training for a half and i fractured my foot and wasn't able to compete. i haven't attempted it since...so i KNOW how hard physically, mentally, and emotionally it is. and seriously 2:40 is fabulous!!! Such an awesome job! I agree that a slower pace together is better than leaving someone behind! Glad you enjoyed it and I hope you continue running. It's amazing.